Roasting chestnuts in your oven is easy! 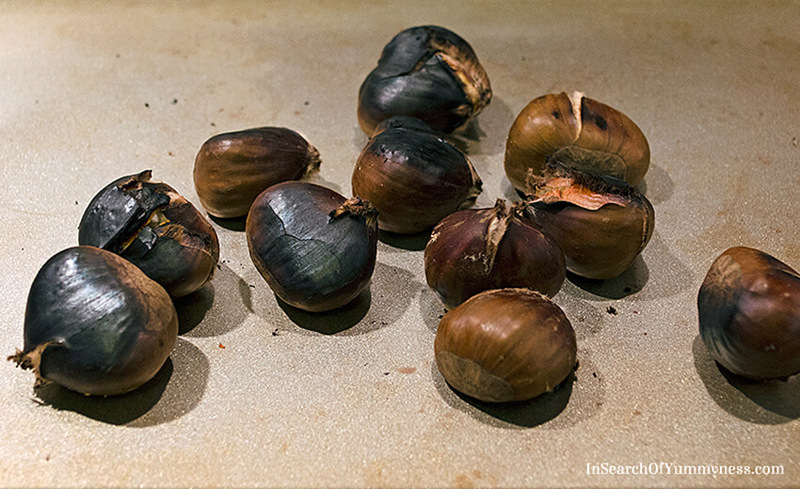 Learn how to roast chestnuts at home, and get tips on how to buy and prepare chestnuts too. 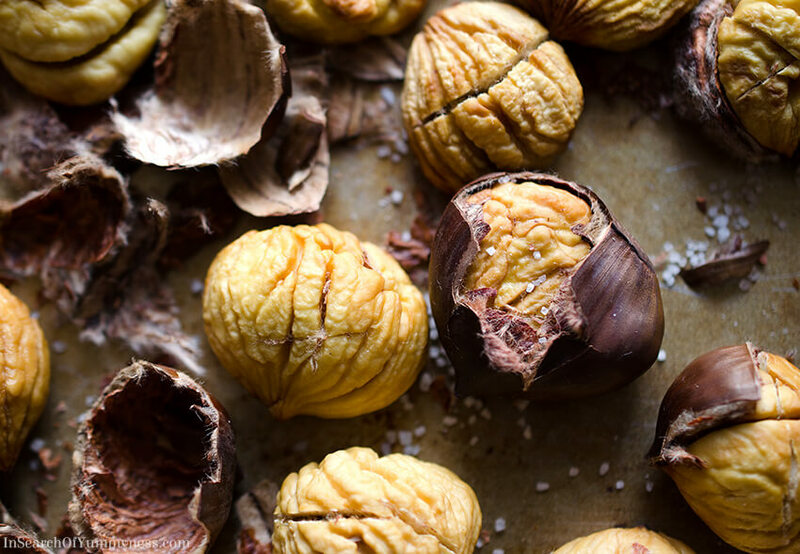 This ultimate guide to roasting chestnuts has been a work in process for the past two years. I’ve prepped, cooked and shelled more chestnuts than I care to admit, and I’ve got the burnt fingers to prove it! While nothing beats fresh chestnuts roasted on an open fire, you can still get some great results roasting chestnuts in your oven. Ok, so it’s not as romantic as roasting them outside, and you’re going to find more than a few hard or mouldy chestnuts along the way, but it’s worth it. I promise! Chestnuts are sweet, edible nuts that grow inside of a prickly casing called a burr. They have an inedible dark brown outer shell, and a bitter paper-like skin that both need to be removed before eating. Fresh raw chestnuts are generally available in groceries and farmers markets from September to November, while vacuum-packed cooked chestnuts are available year round (but I don’t really like the taste of those). Did you know that roasted chestnuts are a street food in Italy. Can you imagine going for walk and being able to buy hot roasted chestnuts in a brown paper bag? I’d be all over that! Most of the chestnuts that we find in big grocery stores have been imported from places in Europe or Asia. By the time they reach Canada, they are far from fresh. This often means that the chestnuts have become dry or mouldy long before you bring them home, and you might not realize it until you’ve gone through the trouble of cooking and peeling them. Which Chestnuts Should You Buy? To be honest, I haven’t noticed a huge difference between the chestnuts from Europe and the ones from Asia. They don’t taste exactly the same, but I haven’t found that I prefer one over the other. 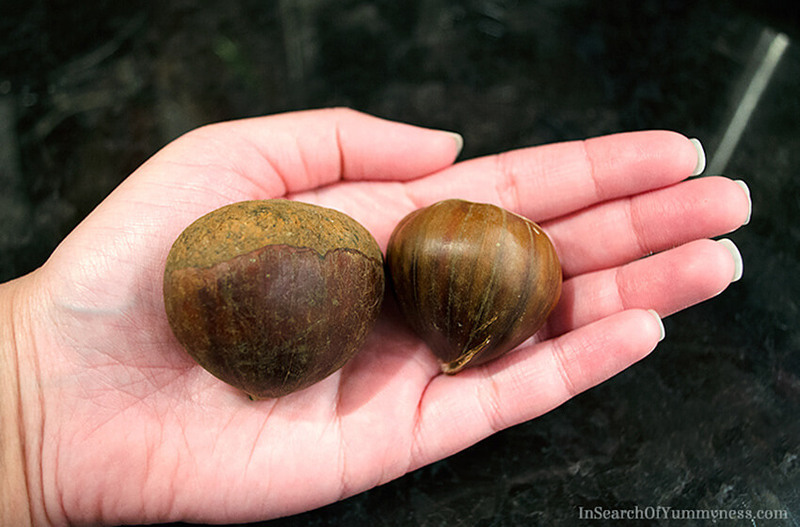 Some of the best chestnuts that I’ve found were tiny ones at a farmer’s market in Toronto. These little gems were from the Niagara region, which is about as local as I can hope to get. I wasn’t sure that I was getting my money’s worth, because they were so small. Honestly though, I am so glad that I bought these. They cooked quickly, and were a breeze to peel. Last year I was able to get fresh local chestnuts from my friend Lis at Jewels Under the Kilt (seriously, that’s the company’s name!). Her chestnuts were also quite small, and they cooked and peeled well. Lis sells her chestnuts at the Evergreen Brickworks Market in Toronto when they are in season (if she’s had a good crop). When it comes to roasting chestnuts, it seems that small and local is definitely the way to go! Also, it’s important to look at the shells of the chestnuts that you’re buying. The shell should be a vibrant brown colour, with a bit of a sheen. As chestnuts get older, they become dull, sad-looking and bland. You can see the difference in this photo below. Oh, and if you can hear the chestnut rattling inside of the shell, don’t buy it. It has probably dried up and will not be edible. If you buy your chestnuts pre-packed (where you can’t select the individual ones you want), you may accidentally bring home chestnuts that are cracked (like the one below), or blemished. These should be discarded. Lastly, avoid buying chestnuts that are in closed plastic bags. Chestnuts can go mouldy when they aren’t able to breathe, so it’s a good idea to look for ones sold in mesh or paper bags, or at least plastic bags that have ventilation holes in them. Be sure to cook your chestnuts soon after purchasing, as they spoil quickly. If you can’t cook them right away, refrigerate chestnuts in perforated plastic bags for up to one week or freeze in an airtight container for up to one month. First of all, you should wash your chestnuts. It doesn’t matter that you’re not eating the shell. 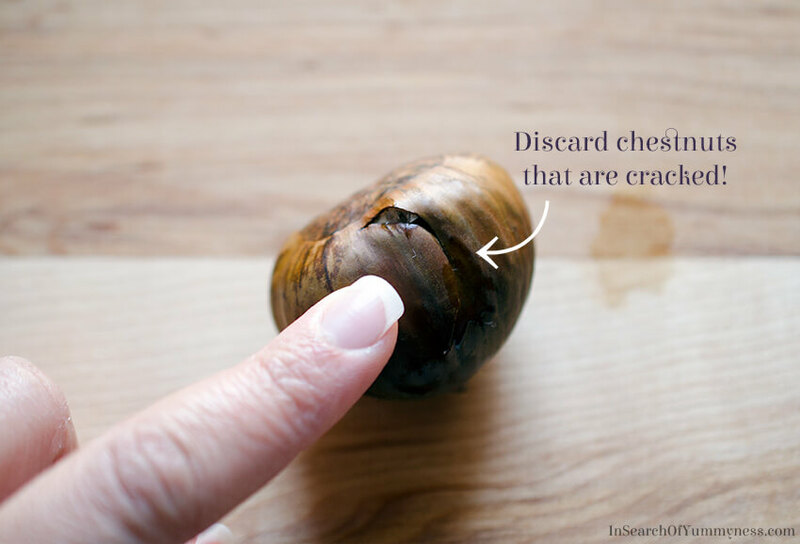 You’re going to touch the shell to peel them when you eat them, so be sure to wash them properly before cooking! 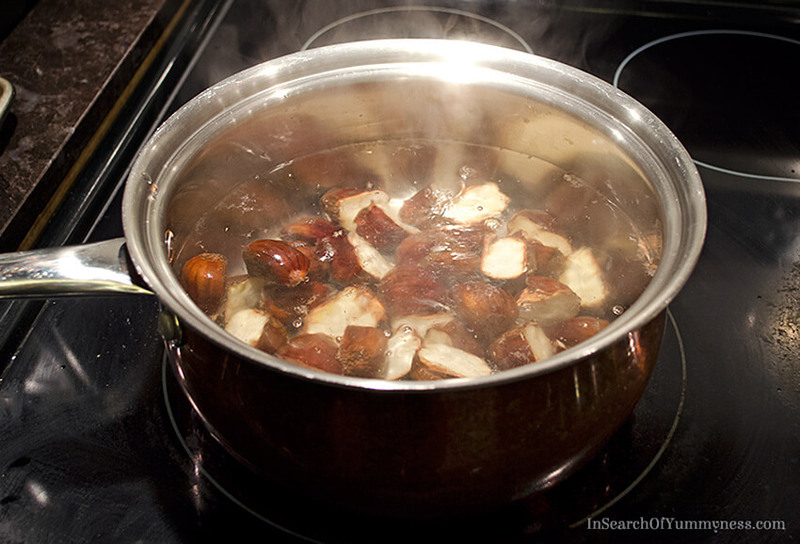 Some people recommend soaking your chestnuts before roasting them, which allows the meat inside to steam. I haven’t found that soaking makes a big difference though, but feel free to try it out. 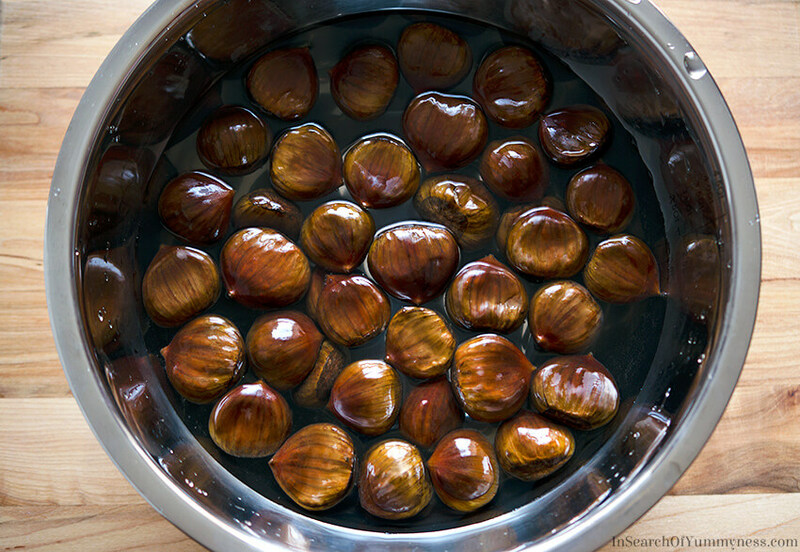 Once your chestnuts are clean, dry them off and place them flat side down on a cutting board. 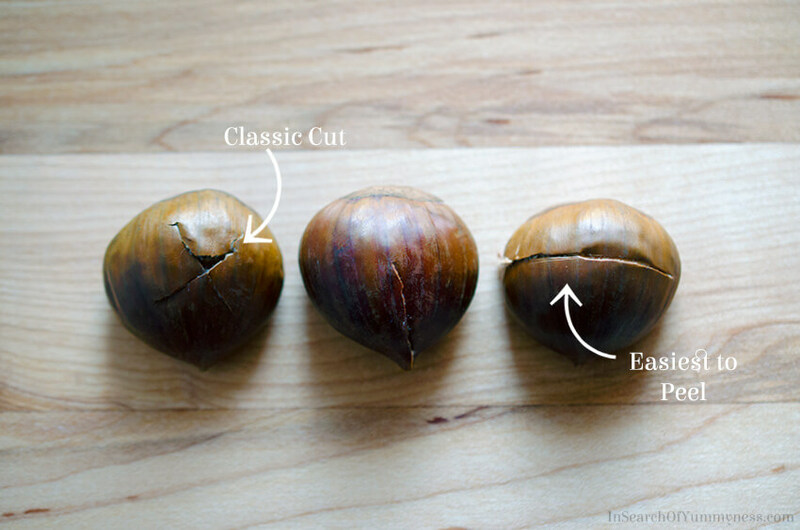 You need to cut a slit into the shell of each chestnut, as this allows steam to escape during the cooking process. Just like a baked potato, if you don’t create a hole for the steam to escape, they will explode. Traditionally, an “x” is cut into the chestnut, but some people prefer to cut a slit across the point end of the chestnut, like in this video. My preference is to cut across the chestnut (being careful to not cut all the way through, you really only want to cut the shell). This cut makes the chestnuts easy to peel, when they cook properly. No matter how you slice them, be sure to use a sharp, sturdy pairing knife and be careful not to cut yourself! As romantic as open fires are, they’re not terribly practical when you live in the city or the suburbs. While there are many different ways to cook chestnuts (I’ll share some other ideas below), my favourite method is to roast them in the oven. Sometimes I use a flat sheet pan, sometimes I use a tray with higher sides, it really doesn’t matter. The important thing here is that you have cut a slit into each chestnut before putting them on the pan. If you don’t, they absolutely will explode. I’ve found that roasting chestnuts at 400°F, for about 25 minutes, works for the imported chestnuts that I find in most groceries. The smaller local chestnuts take about 15-20 minutes, and really larges ones take up to half an hour. You’ll have to figure out if the chestnuts are cooked based on smell (they should smell nutty) and touch (cooked chestnuts are HOT!). If your chestnuts are a bit underdone, just pop them back into the oven for a another few minutes. 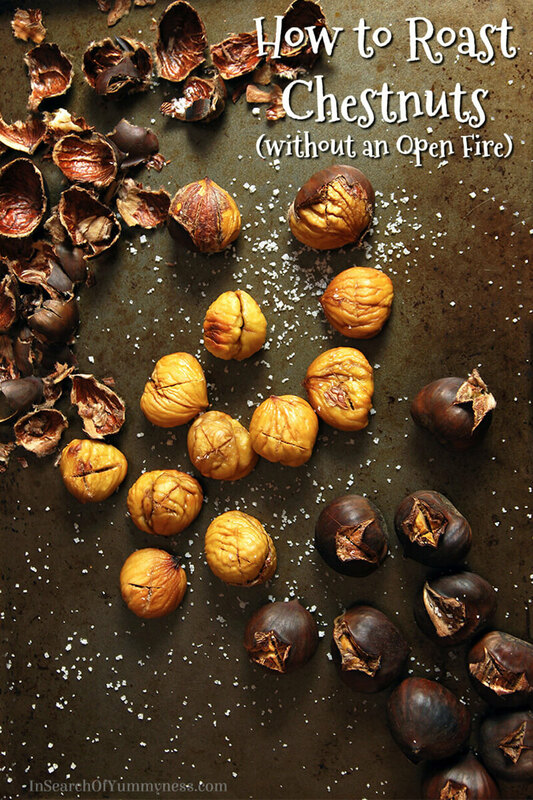 Be careful not to overcook or burn your chestnuts, like these ones below. This will make them so hard that you could confuse them with pieces on a checkers board. If your chestnuts are as black as the ones in my photo here, then you’ve probably overcooked them. Oops! They should only be this dark if you’re cooking them outside on a fire. Now, I will say that I do miss a tiny bit of charring on my chestnuts. In fact, the smell of slightly burnt chestnuts is one of my favourite holiday scents (has anyone made a burnt chestnut candle yet?). If you roast chestnuts on an open fire, you tend to get some blackened bits and a nice smoky smell. To replicate this, I sometimes throw the chestnuts onto the bottom of my oven for a minute or two. If you choose to do this, you’re doing so at your own risk. I don’t want to hear that you burnt your house down because you put chestnuts on your stove’s element and forgot about them! If you look up how to cook chestnuts on Google, you will find all kinds of recommendations. Here are a couple other methods that I tried. 1. Roasting in a cast iron pot. This method works almost as well as roasting the chestnuts on a tray, except that it takes at least 10 minutes longer to cook. This is because the cast iron pot has to heat up before the chestnuts get a chance to cook. I prefer to roast my chestnuts in the oven. I can see the benefit of boiling the chestnuts if you’re going to bake with them. They do get much softer than their oven-roasted version. However, I really thought that they were lacking in flavour. You might prefer to buy those little packages of cooked chestnuts at the store if you’re going to use them in soups, stuffing or in baking. Maybe. I haven’t found a brand of cooked chestnuts that I really enjoy yet. If you want to get the shells and the bitter paper-like membrane off of the chestnuts, you must peel them when they’re still very warm. The hotter they are, the easier they will be to peel. Obviously, I don’t want anyone to burn themselves! So, please be careful. Unfortunately, as chestnuts cool the membrane begins to stick to the flesh of the nut. Once the chestnuts have cooled completely, you may find that the membrane is down right impossible to get off. My trick for handling hot chestnuts is to use an old kitchen towel. I take one end of the towel and cover my left hand, and place the chestnut in that hand. Then, I use the other end of the towel in my right hand to peel off the shell. Not only does the towel protect my hands from the heat, but I’m less likely to cut myself this way too. I can’t tell you how many times I’ve cut my fingers on sharp bits of chestnut shells. It’s not fun, especially when the shell goes under your fingernails. Well, on THAT happy note (sorry! ), I hope you’ve found this article useful. Despite everything I’ve told you here, the reality is that there is no “correct” method for roasting chestnuts. This is because not all chestnuts are the same. They come in different sizes, some have membranes that go through the flesh or the nut, and it can be difficult to figure out how old your chestnuts are. Once you figure out what works best for the chestnuts in your area, you’ll be happily roasting chestnuts in your kitchen. Good luck! Don't have access to an open fire? No problem! 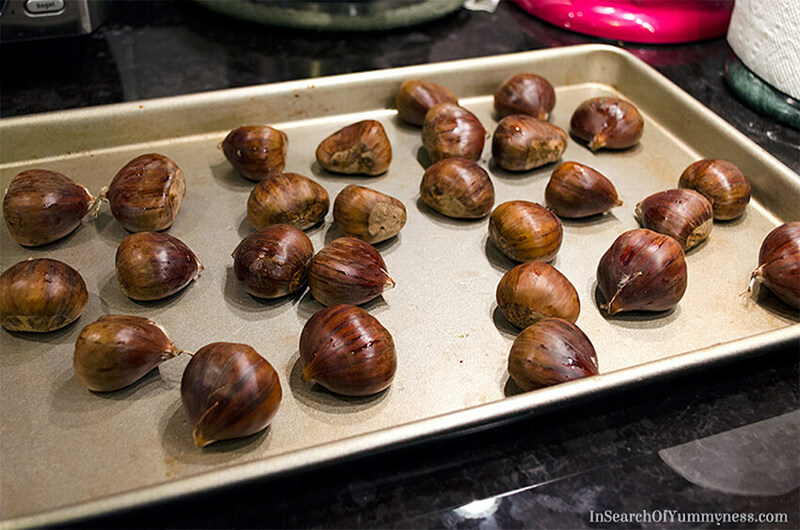 Roasting chestnuts in your oven is easy! Wash and dry your chestnuts. Place chestnuts flat-side down. 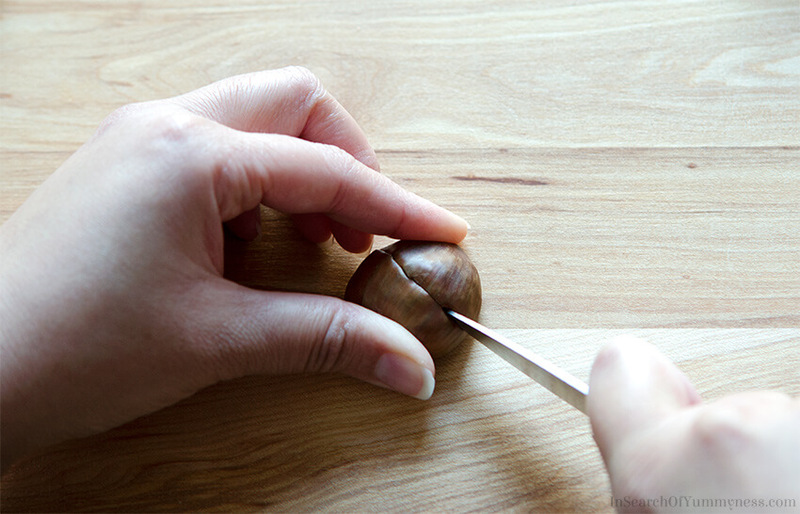 Use a sharp pairing knife to cut a slit into the top of each chestnut. Place scored chestnuts in a single layer on a baking tray. Roast chestnuts in the centre of the oven for about 25 minutes. The bigger the chestnut, the longer they will take to cook. 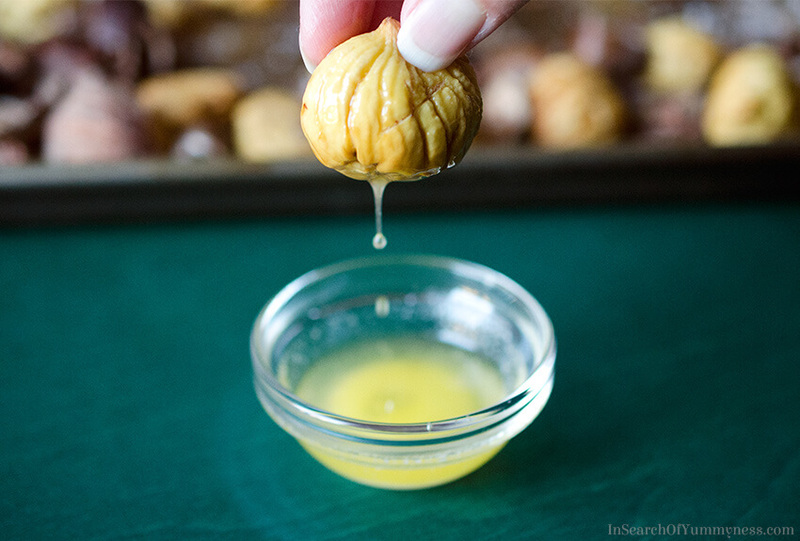 Chestnuts are done when they smell nutty, and are hot to the touch. 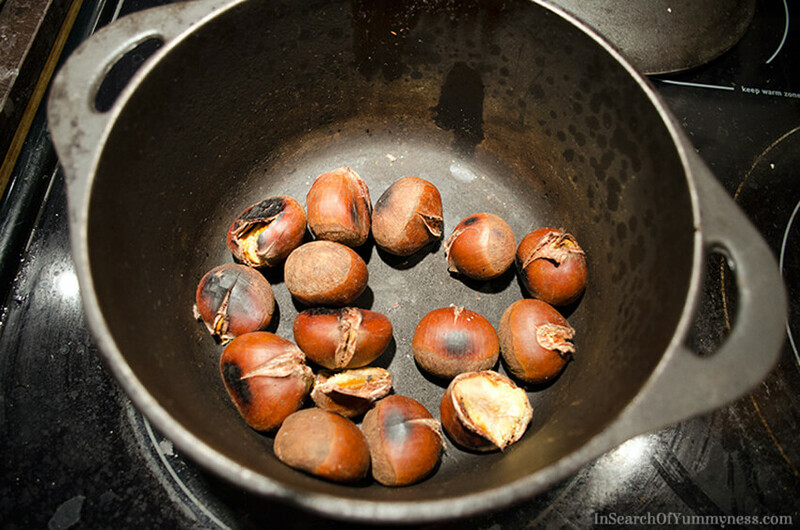 Remove chestnuts from oven, and allow to cool enough to handle them. 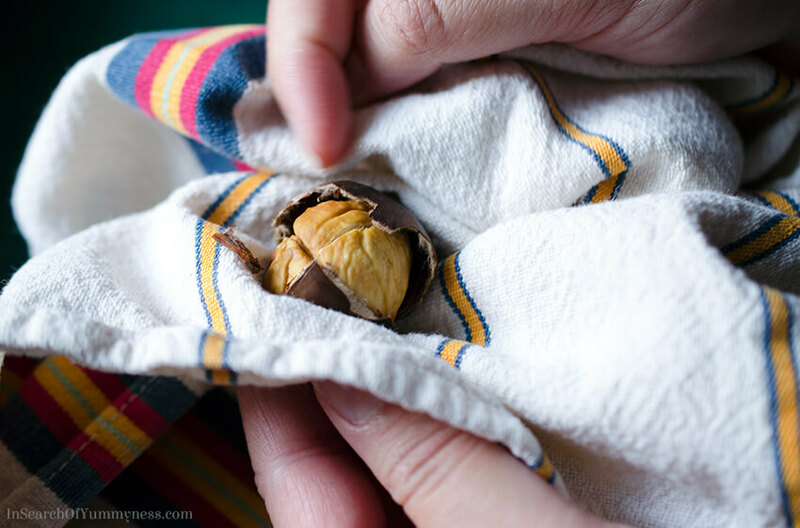 Peel warm chestnuts using fingers and a tea towel, working quickly. Serve shelled chestnuts with salt and melted butter, if desired. 1. Be careful not to burn your chestnuts, as they will become too tough to eat. 2. Try to peel the chestnuts while they are still hot, as the paper-like skin that covers each chestnuts becomes very difficult to remove once they have cooled down. This was a really fascinating post, Shareba. I’ve never known how to cook chestnuts and found it really interesting (also liked the what not to do sections with the old nuts and burning the chestnuts). I’m now off to google exploding chestnuts, as I’m a little curious… hehe. I hope you try them Suki! Years ago we tried to roast whole chestnuts in our fireplace. After cleaning up the mess that ensued we forgot about making them. Lately I’ve been wanting to have another go at them so I’m very happy to find your post. Thanks Shareba! I hope it’s helpful Bernice! I always see these at the grocery store but am always too intimidated to cook them. Thanks for the tips for roasting them! I’ll have to pick some up next time I see them. Wow this is really unique! Thank you for the detailed recipe! Thanks so much Diane! I’m hoping that people find it useful! Hi and thanks for the beautiful page. I soak almonds, then drive off the water in a very low temperature oven. This with the understanding that letting the nuts (seeds) do their initial step, absorbing water, enhances their nutritional value. They come out softer and crunchier too. I’ve just pealed one chestnut and put it in warm water. I’ll see if it plumps up as the almonds do. Do you know anything about this? Thanks. Jane in Vermont, usa. Hi Jane, thanks for your comment. I have soaked shelled almonds and roasted them, and that works really well. However, I’ve never soaked shelled chestnuts. I have soaked the chestnuts with the shell on before baking, which can sometimes make them easier to peel. I would be interested to know how soaking the peeled chestnuts worked out for you. Please let me know! Hi, I will let you know. Thanks for your post and best wishes for the lovely season of candles and bright colors, if not the great Christian drama. I love all of your ideas. Great information. I am getting my family an Air Fryer for Christmas. After doing a little research, it looks like it is possible to roast them using this appliance. Going to try it so we will see. Wish us luck! Good luck Sandy!! Let me know how they turn out in the air fryer! I’m glad the article was useful to you Andy!